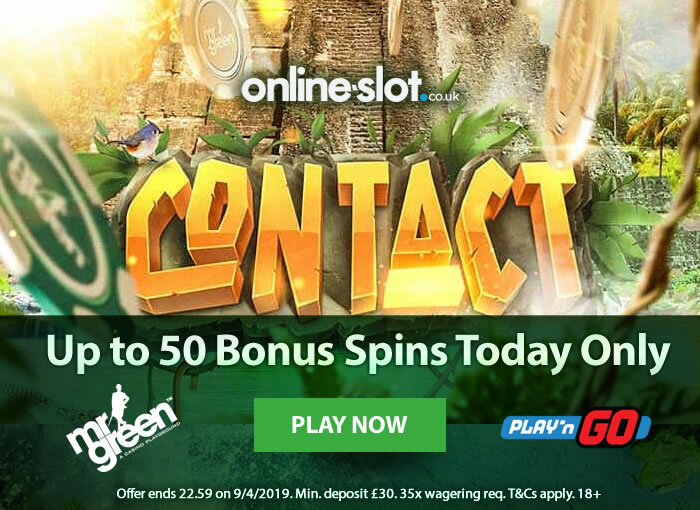 Mr Green Casino is celebrating the launch of its exciting new Mayan-themed slot Contact with a cracking bonus spins giveaway. It’s only valid today, Tuesday the 9th of April (2019), so you’ll have to be quick if you want to grab your share. Getting your bonus spins couldn’t be easier though. Just make a deposit of £30 or more and you’ll be eligible for some freebies. Every £2 you deposit will get you 1 bonus spin. Deposit the minimum £30 and you’ll receive 15 bonus spins. To get the maximum 50 bonus spins, you’ll need to deposit £100. It really is that simple. Those bonus spins come with a 35x wagering requirement. Don’t wait too long to get stuck in though. The offer is only open until 10:59pm tonight! So what can you expect from Contact? It’s a highly volatile, 5 reel, 7 row slot that takes inspiration from a lost Mayan civilisation. Powered by Play ‘N Go, winning combinations are created by creating clusters of matching symbols. The cascading reels game engine means that successful symbols are blasted away and new ones drop in and replace them. The cascades keep on coming as long as a new winner is created. If you manage to fill rows 2, 4 and 6 with the same matching symbol you’ll bring multipliers into play. These can send payouts rocketing by 2x, 3x or 4. The main feature is the Free Spins feature. Even more multipliers are in play here. Look out too for the Block Destroyer which can activate to increase the multipliers, upgrade symbols or deliver extra free spins. Filling whole reels with matching symbols here brings the Super Bonus Round feature into play. As you can guess, the multipliers (up to 30x) and prizes get even bigger here. As usual for a Play ’N Go slot, the design here is good. The gameplay really offers something different too. Throw some super high variance into the mix and Contact becomes a very playable game. Unlock your free spins at Mr Green Casino and have a crack at Contact today. Sign up to get 20 no deposit bonus spins and make your first deposit to get a 100% bonus up to £100 plus 200 more bonus spins.